Wiredoc.com is a new service that allows you to transfer computer files to other users. File transfer services are quite common. 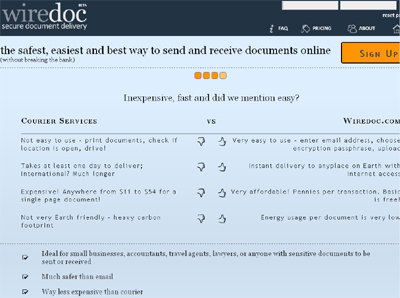 But what distinguishes wiredoc.com is comprehensive approach to encryption and security during the entire process. Using a simple password scheme, they encrypt your file directly in the browser before uploading your file to their servers and intimating receivers of the file by email about availability of the file. Recipients can then simply click on the download link in their email to download the file. The sender gets an indication of whether the recipient has downloaded the file. In addition, the sender can control the number of downloads of the file. Browser based encryption of documents being shared.